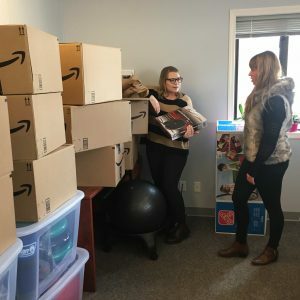 SCDP team members beginning the unpacking process of multiple shipments of equipment for distribution to early learning centres through out the Comox Valley. 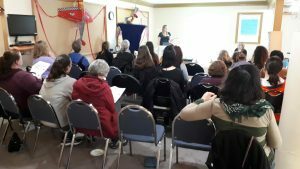 In 2018, the Comox Valley Supported Child Development Program (SCDP) was given some one time funding from the Ministry of Children & Family Development. The funding was to be allocated to equipment and resources for early learning centres through out the Comox Valley. To help them decide what would be the most useful way to use and distribute these funds throughout the community, a survey was developed to collect information about what local centres might benefit from the most. Program staff started by establishing that each centre would receive a sensory kit and one large item of equipment such as a tricycle, wagon or egg chair (depending on funding). The survey asked questions such as ‘Would your centre prefer to receive items singularly or in a kit?” (bulk amount of one item). Within these kits would be an array of items, giving child care professionals and the children options to choose from. Surveys were completed and returned by December, 2018 and since then, program staff had been busy analyzing results, ordering and compiling equipment in preparation of distribution to each of the centres. Distribution took place on Wednesday April 3 at the Child Development Centre. A representative from each of the centres who had completed the survey was invited to receive their items. In addition to the donated supplies being distributed, representatives received professional development training from the SCDP team of child development professionals. The training encompassed a number of presentations. Firstly, one of our Occupational Therapists, Carlin Lindsay shared information about Sensory Integration. This is the process of the brain organizing and interpreting information from all of our senses. She got into how sensory processing and regulation in children provides a crucial foundation for later, more complex learning and behaviour. 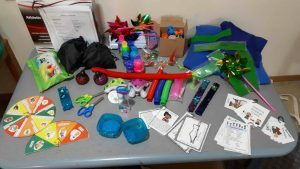 Providing Sensory Kits to children can be used to both calm and stimulate a child’s sensory system, while also aiding with active learning, focus, and motor development. Sensory Kits loaded with a variety of sensory tools were prepared and provided for each centre including instruction on how to use each of the items. 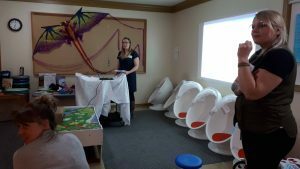 Lindsay Mallette, one of our Supported Child Development Consultants, spoke with the group about some additional equipment that would be available for lending to each of the early learning centres. As part of the funding, four Circle Time Kits were purchased and prepared by the SCDP team. 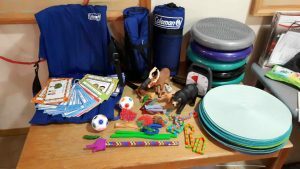 These kits are now available to the centres to borrow from the Comox Valley Child Development Association. They are designed to make circle time more inclusive for children, who may be harder to engage, who have communication delays or difficulty sitting still or may simply feel shy or put on the spot in this type of social situation. Circle Time Kits contain a number of social games and activities along with inviting and fun seating options. The team at SCDP thoroughly enjoyed this opportunity to be be part of receiving and executing this funding provided by the Ministry. It was an extremely rewarding opportunity to not only plan and provide this equipment and tools to many of the Comox Valley early learning centres but to also use this opportunity for passing on knowledge through the training and use of these new kits and equipment. We have no doubt the new tools will be a great benefit to the kids who get to utilize them. With special thanks to Planet Kids Toys for all of their support through this process and Matt our Maintenance Worker at CVCDA for his time and expertise in assembling much of the equipment. The Supported Child Development Program (SCDP) supports the right of all children with diverse abilities to participate in community-based child care settings. Supported Child Development coordinates services for children from birth to twelve years of age who require extra support. SCDP is one of the many programs offered through the Comox Valley Child Development Association.